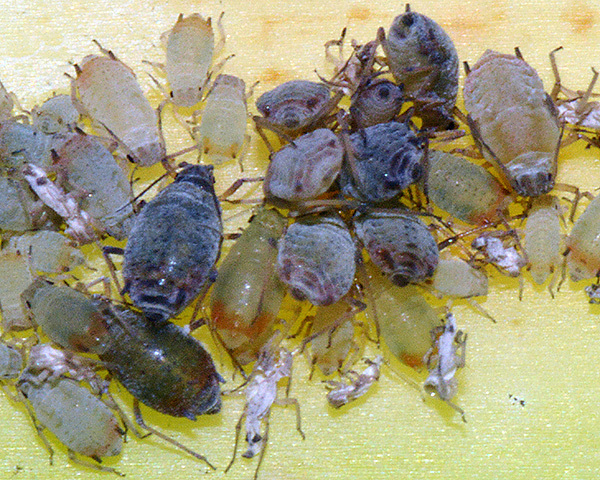 Adult apterae of Dysaphis tulipae (see first picture below) are pale greenish yellow, but may appear whitish because of an overlay of white powder. There is often a reddish suffusion around the siphunculi which is more prominent in immatures (see second picture below). The longest hairs on the third antennal segment are 10-27 μm, often somewhat blunt apically, and 0.6-1.1 times longer than the basal diameter of that segment. There are spinal tubercles on the head and on abdominal tergite 8. The siphunculi are 1.5-2.0 times the length of the cauda and are slightly thickened in the middle. 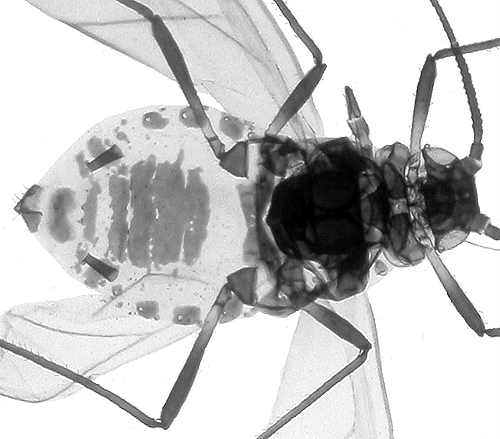 The body length of the Dysaphis tulipae aptera is 1.7-2.3 mm. The alate Dysaphis tulipae (see first picture below) has a dorsal patch with lateral extensions which close the space between it and the prominent marginal sclerites. The antennae have 24-55 secondary rhinaria on the third antennal segment, 3-14 on the fourth segment, and none on the fifth. The second picture below shows an adult aptera of Dysaphis tulipae in alcohol. The micrographs below show clarified mounts of an apterous and alate Dysaphis tulipae. 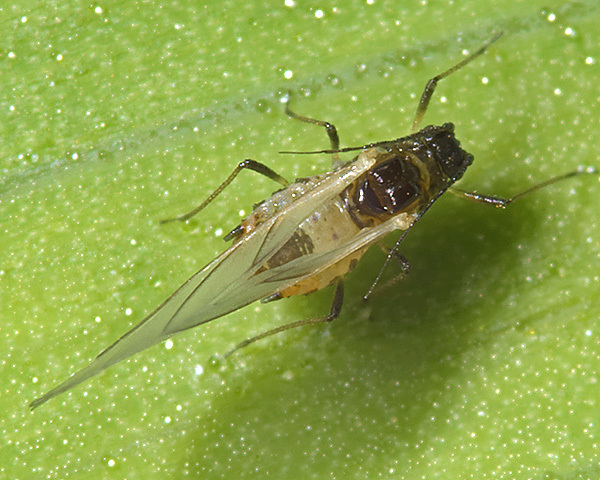 The tulip bulb aphid is found on the bulbs, shoots and leaves of many monocotyledonous plants in the lily and tulip (Liliaceae), crocus, gladiolus and iris (Iridaceae), arum (Araceae) and banana (Musaceae) families. The species is entirely parthenogenetic with no sexual forms. 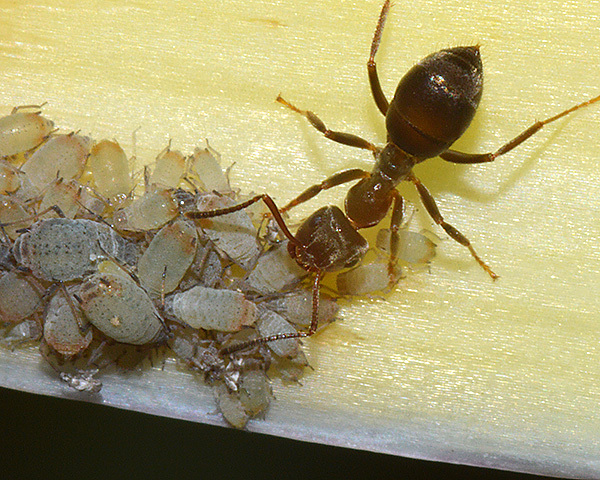 Colonies are commonly ant attended. Dysaphis tulipae has a worldwide distribution apart from South America. 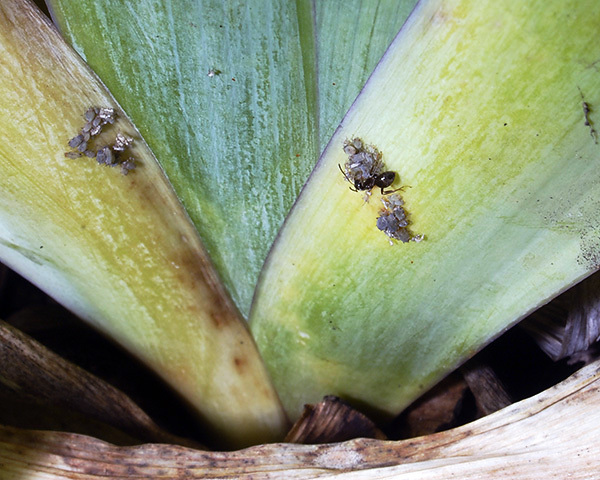 The tulip bulb aphid can be seen on the older leaves of lilies and irises in summer, where it forms tight colonies as shown in the pictures below. It can also be seen on bulbs and rhizomes of lilies and crocuses in winter storage. In Britain we have not found Dysaphis tulipae to be a common species, but colonies are not especially noticeable being low down near the base of the plant, or concealed under the dried outer scales of the bulb. 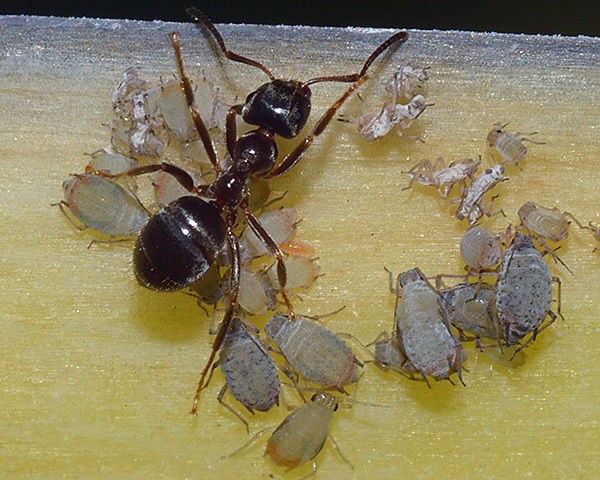 The few Dysaphis tulipae colonies we have found have been rather loosely attended by the black garden ant (Lasius niger). Dysaphis tulipae has a fairly varied cohort of potential competitors depending on whether it is feeding on iris, lily or Araceae. Blackman & Eastop (1984) list 10 aphid species worldwide as feeding on iris. 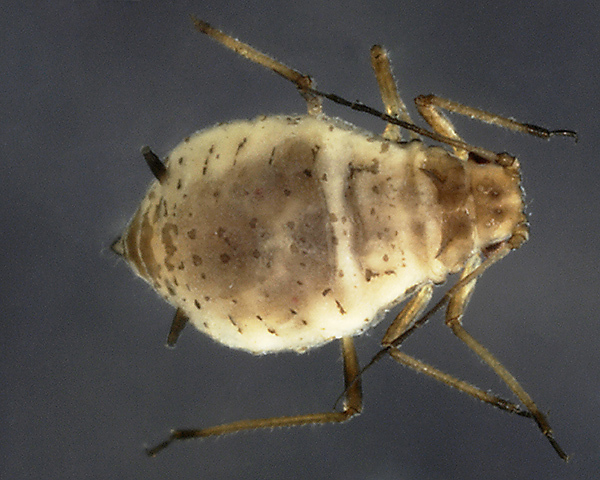 All of which, Baker (2015) lists as occurring in Britain: Aphis newtoni, Aulacorthum solani, Dysaphis tulipae, Macrosiphum euphorbiae, Metopolophium dirhodum, Myzus ascalonicus, Myzus persicae, Neomyzus circumflexus, Schizaphis scirpi and Sitobion avenae. Blackman & Eastop (1984) list 13 aphid species worldwide feeding on lily, of which Baker (2015) lists 7 aphid species as occurring in Britain: Aphis fabae, Aphis gossypii, Aulacorthum solani, Dysaphis tulipae, Macrosiphum euphorbiae, Myzus persicae and Neomyzus circumflexus. Blackman & Eastop list 10 species of aphid as feeding on Arum species worldwide, and provide formal identification keys. 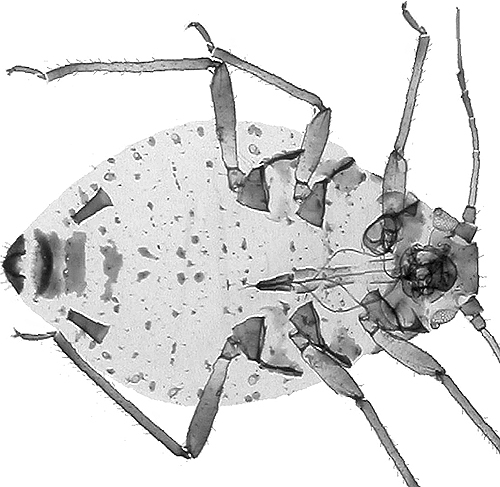 Of those aphid species, Baker (2015) lists 8 as occurring in Britain: Aphis gossypii, Aulacorthum solani, Dysaphis tulipae, Macrosiphum euphorbiae, Myzus cymbalariae, Myzus persicae and Neomyzus circumflexus, Patchiella reamuri. 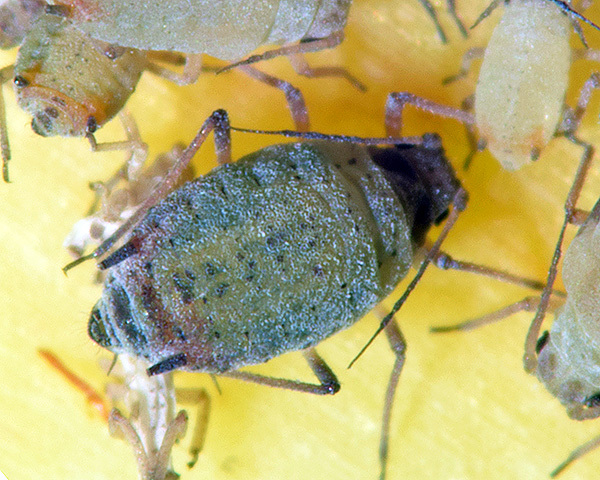 The tulip bulb aphid can inhibit and distort the growth of young shoots, and heavy infestations may kill the plant. It can also transmit viruses such as tulip breaking virus. 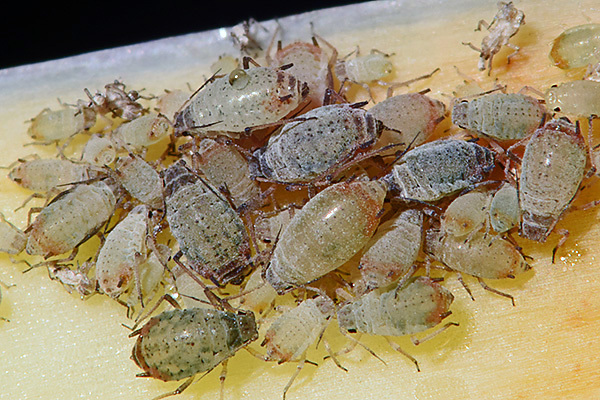 Alford (ed) (2000) recommends regular fumigation of bulb stores with nicotine smoke to prevent a build-up of aphid numbers. Alford, D.V. (2000). Pest and Disease Management Handbook. Blackwell, Oxford.